“The undersigned farm organizations support finding a path forward to reaching agreement on a new five-year farm bill before current program authorities expire on Sept. 30. We are disappointed that the House Republican leadership has decided to not move forward with the House Agriculture Committee’s bill before adjourning for the August recess. That bill would provide the disaster relief our farm and ranch families need at this time. “Instead, we understand the House may consider a separate disaster bill, under suspension of the rules on August 2, to make supplemental agricultural disaster assistance available for Fiscal Year 2012. 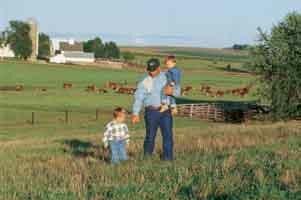 Specifically, the bill retroactively extends the Livestock Indemnity Program (LIP), the Livestock Forage Program (LFP), the Emergency Livestock Assistance Program (ELAP) and the Tree Assistance Program (TAP) so that producers are helped for Fiscal Year 2012. All of those programs expired in 2011. Offsets to pay for the disaster assistance would come from imposing caps on two conservation programs, the Conservation Stewardship Program (CSP) and the Environmental Quality Incentives Program (EQIP). “We do not oppose passage of a disaster assistance bill, but note that almost identical provisions to retroactively extend these four programs are included in the Senate-passed farm bill and the bill reported by the House Agriculture Committee. Those measures would likely be included in any conference committee report. It is imperative that we pass a comprehensive, long-term farm bill. Farmers and ranchers always face decisions that carry very serious financial ramifications, such as planting a crop, buying land or building a herd, and we need clear and confident signals from our lawmakers. “Assistance for cattle and sheep producers is very important and something that we strongly support in the five-year farm bill, but it is also important that assistance be provided for other types of livestock and for producers of fruits and vegetables. The disaster assistance bill does not help hog or poultry producers and only provides limited assistance via the grazing program for the dairy industry. The bill does not help dairy producers who are not located in a designated disaster county with grazing assistance and does not address high feed prices for dairy, hog or poultry producers. Many producers of fruits and vegetables may not have crop insurance available to them as a risk management tool, and they too need some type of help, which this package does not address.